Trading under the new name Rheinmetall Soldier Electronics GmbH, the former Oerlikon Contraves Deutschland GmbH of Stockach, Germany, supports the world’s armed forces with an extensive array of high-tech products and services. The company, which has belonged to the Rheinmetall Group since 1999, develops and manufactures special components for infantry applications. The name change comes into effect on 1 September 2009. “Thanks to our wide range of deployment-oriented soldier systems, our company is particularly well placed for future growth. The new name calls attention to our product portfolio, and sends a clear message to the market, which means we’ll be able to do a better job of positioning ourselves. We’re totally committed to supplying infantrymen with an optimum, mission-oriented suite of equipment,” declares Wolfgang Kammerlander, managing director of Rheinmetall Soldier Electronics GmbH. Products such as laser-based aiming systems (LLM: laser light modules), fire control units for dismounted soldiers and the DSID (dismounted soldier identification device) exemplify the company’s commitment to improving the combat effectiveness, survivability and accuracy of fire of today’s armed forces. The name change also betokens the company’s successfully integration into the Rheinmetall Group’s C4ISTAR division, significantly reinforcing one of the six product-oriented divisions that comprise Rheinmetall AG’s defence technology arm. With some 100 staff, Rheinmetall Soldier Electronics is an important employer in Stockach, located near Lake Constance in southwest Germany. Its customers include the armed forces of Germany, its allies and other likeminded nations. The name Oerlikon Contraves Deutschland GmbH has been familiar to German procurement officials ever since the introduction of the Gepard self-propelled antiaircraft system in the 1970s. Strongly oriented to the needs of dismounted infantry, Rheinmetall Soldier Electronics GmbH’s comprehensive product range embodies the strengths and traditions of the former Oerlikon Contraves Deutschland GmbH. 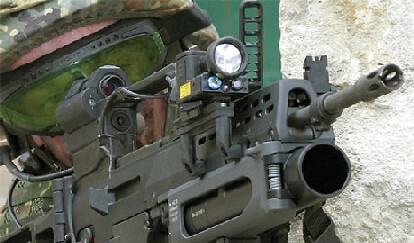 Expanding beyond its previous role as a manufacturing plant, Rheinmetall’s Stockach site has emerged as an important R&D centre for infantry system components, greatly benefiting from the synergies of the Group’s C4ISTAR division, which in turn benefit the modern military and the soldier on the ground. Longstanding experience and a strong commitment to quality and dependability have earned the company the trust and respect of its customers and partners. Newly renamed, Rheinmetall Soldier Electronics GmbH is poised to carry this tradition forward.